I would like to tell you that my mysterious long absence was due to a secret mission for the CIA. Sadly, there was no spying or espionage involved. 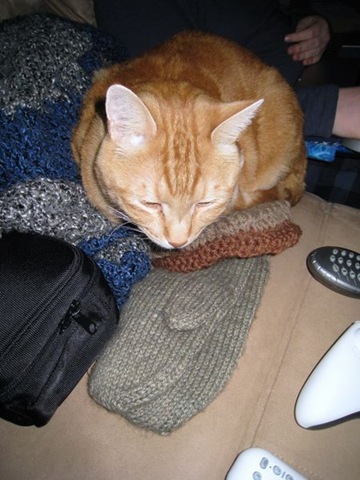 I’ve been very busy, mostly with cleaning and organizing and not knitting. I’m not really enjoying the knitting project that I’m working on right now but I am determined to finish it. I’m sure you know how that feels- it makes the project drag on so much longer than it should even if you’re knitting just as fast as normal. I have also been weaning off my antidepressant and, well, it hasn’t gone well. I’m tired all the time and irritable and I haven’t felt much like writing. 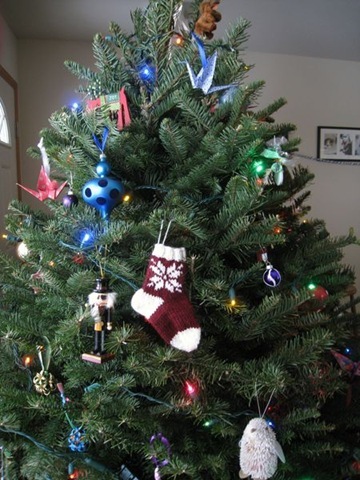 I’ve been working on this post for four days! It would have been much more interesting if I were a secret agent. I bought the fiber right after my spinning class at the Sock Summit. It’s dyed with real indigo. Have I written about this before? I can’t remember. It’s 100% Blue Faced Leicester from a Verb for Keeping Warm. The woman who sold me the fiber at the Summit was really helpful and friendly and I’ll be buying from them again! I spun this on the handmade bottom-whorl spindle from the Sock Summit too, using a mostly short-draw worsted style of spinning. I r.nsay mostly because this is very much a beginner’s yarn and I played a little fast and loose with the fiber. 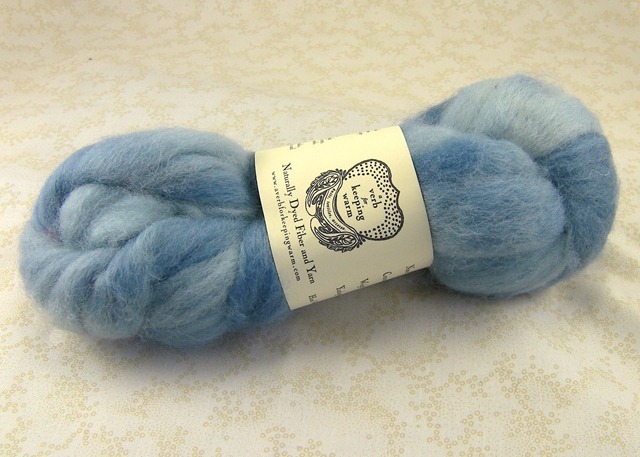 I didn’t sample the fiber and I didn’t stop very often to see if what I was spinning matched what I had already spun. Well, it turned out mostly consistent, although some sections are almost thread-thickness. 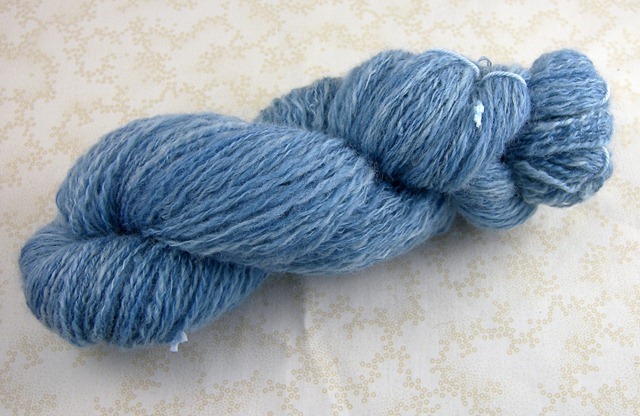 I had originally intended to make this a three-ply yarn so I was trying to spin the singles pretty fine. By the end, though, I decided to just make it a two-ply yarn. I didn’t have a very consistent amount of twist in the singles and I was sure that they were over twisted. 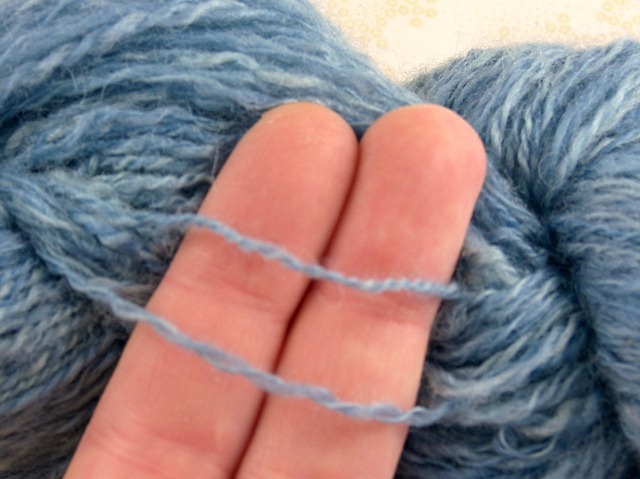 But when I plied them, I didn’t have to put in a lot of twist to make a “balanced” yarn. This led to some problems plying… to get the yarn to look and feel nice, I had to over-twist during plying; the “balanced” yarn has hardly any twist at all in it. I started over-twisting about halfway through. 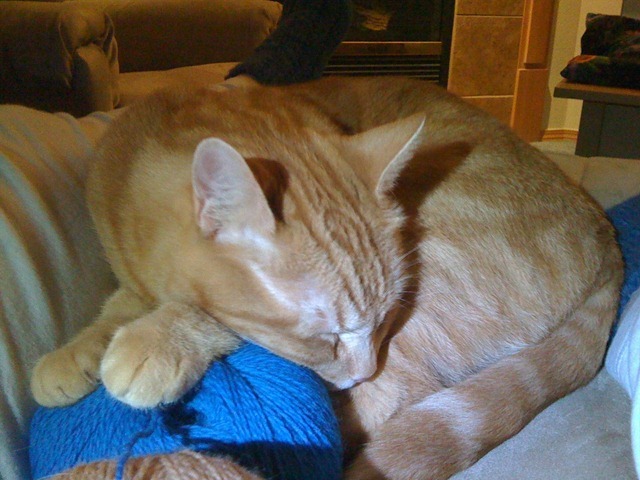 Maybe I’ll knit something with it… maybe it’ll just be pretty yarn to look at. One of the bedrooms in our house has a French door with glass panels instead of a regular door. This room is technically my studio but that hasn’t stopped me from littering the rest of the house with projects, yarn, beads, and other detritus of the crafter. When we have multiple house guests at once, the addition of an air mattress magically turns this room into an extra guest room. As you can imagine the glass door is a little problematic from a privacy standpoint. Since this situation only comes up a few times a year, the usual solution is a sheet hung over the door. Efficient but ugly to say the least. So I grabbed some over-the-door hooks, two short curtain rods, and some fabric (on sale!) 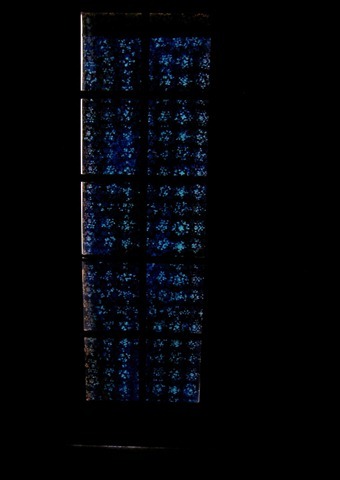 and made a curtain for the door. It was a very simple project. I had originally intended to make the curtain a little wider and use two different fabrics, one on each side, but then I got lazy. Possibly because I had already worked on one very time-consuming sewing project already that day. 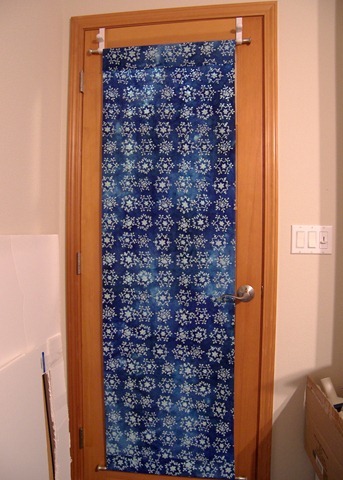 I simply folded the fabric in half, topstitched various parts and hung it on the door. Somehow the bottom is crooked despite careful measurements. I’m going to pretend that the curtain is perfectly straight and it’s the door that’s the problem. As an added bonus, the fabric looks really cool when the light from the room is shining through it. And yes, the curtain is just a hair short width-wise. Again, it’s the door’s fault. I am Kif, The Cat. 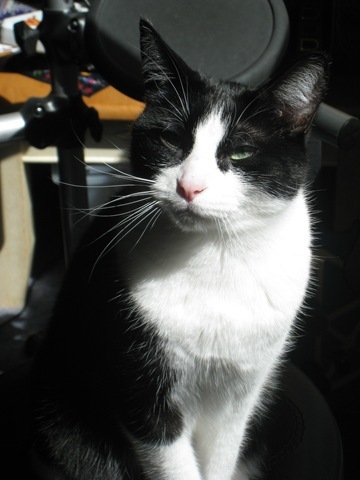 I will be writing this post, since my human has broken her brain. At the moment she is sitting in the corner gibbering something about a ruler conspiracy. She finally decided on some needles, even though she said the “swatch” didn’t get “row.” Then she ordered string and some needles that don’t have tails. (They came in a box that smelled really interesting.) 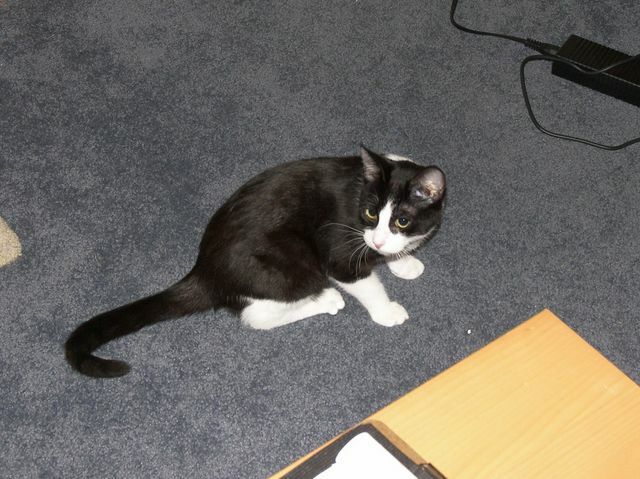 She made another “swatch” with the tailless needles, got it wet, and hid it in the Secret Room. Then she yelled something very, very bad. Then she started making more “swatches” with the tasty needles. This time, she had to use smaller and smaller needles. I tried to tell her that if she had given up on the idea of using the tailless needles originally and gotten the string sooner and only had to make one “swatch,” she’d be halfway done by now. But she thought I was just squeaking at her to be noisy. This morning, she exited the Secret Room. She threw a “swatch” to the floor and huddled in the corner. I have deduced that this “swatch” was knit with the needle size suggested by the pattern and got “stitch and row” on the first try. She keeps saying that the ruler must have gotten longer, since this couldn’t be possible and how could she have had to knit seven swatches only to end up with the suggested needle size? Hopefully this will pass and she will remember to feed me tonight. I’m sure if she can dish out cat food, then she will be able to write her own blog posts. This job is so beneath me. 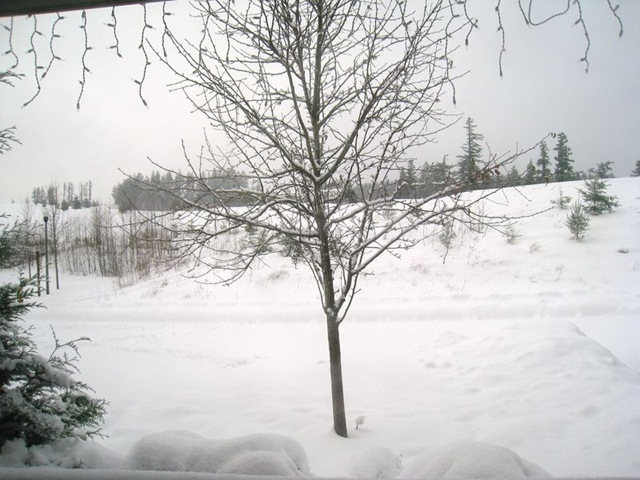 We’re having a massively white Christmas here. I mean, massively. 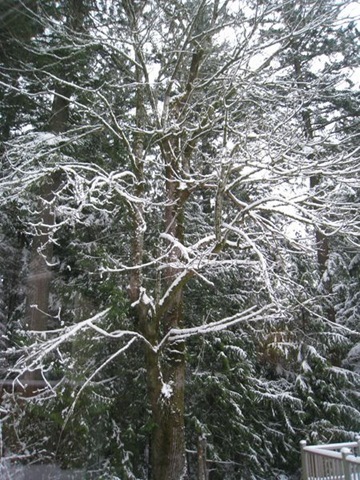 It’s pretty much been snowing all week. Well, I had my surgery today. Despite having a mouthful of gauze, everything’s fine. Of course, the painkillers haven’t worn off yet… I’m working on a simple pair of socks to keep me occupied, so hopefully tomorrow will have a much more interesting blog entry than this one. You know, something actually about knitting or crafts. 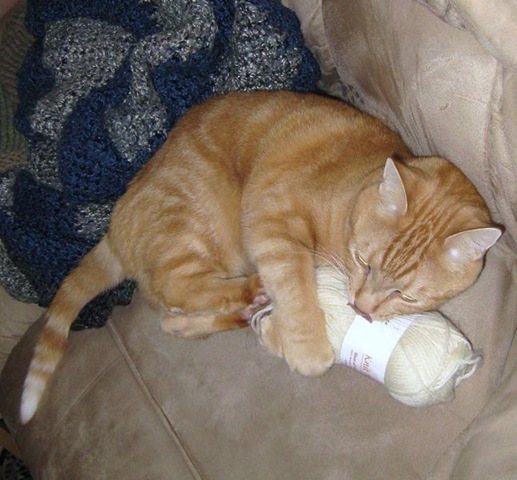 To keep you interested until I can actually type without getting lightheaded, check out this blog: Stitchy Mcyarnpants. The Museum of Kitschy Stitches is hilarious, both the pictures and the commentary. Stitchy has a great sarcastic sense of humor. Always makes me laugh. 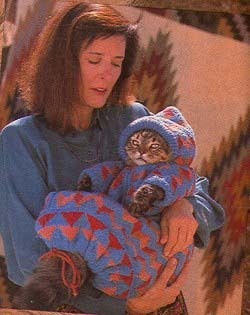 This is one of my favorites… Can you imagine knitting this??? Or actually putting a cat in to it?? Edit: Ok, I don’t know what’s up with this picture. It keeps disappearing and reappearing. Hopefully it’ll STAY PUT THIS TIME! Hear that, you mangy JPG? Disappear one more time and I’ll make sure no one ever finds you or your url again. Well, enough about my cats. 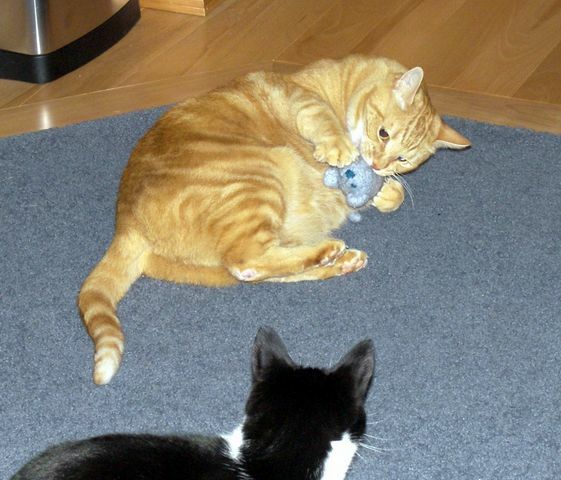 I bet you’re just itching to know how to make one of those mousies. Update 5/23: I’ve fixed the increases for the mouse head. I have no idea what happened when I originally wrote it up- those increases made NO sense. If I didn’t know better, I’d say I was drunk when I wrote it. Anyway, I apologize to anyone who tried to make the mouse with those funky instructions! Update 5/26: Fixed the number of stitches between the mouse ears. Corrections in purple. Yarn: Any feltable, worsted weight wool (I used Knit Picks Wool of the Andes in Lake Ice Heather) plus a few inches of contrasting yarn for details. 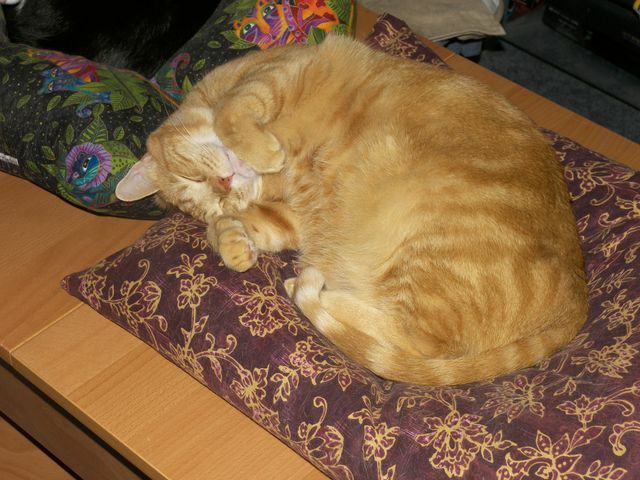 Other materials: Tapestry needle, toy stuffing, catnip, sewing needle and coordinating thread. Gauge: Not really important, since the mouse will be felted. Make Bobble: Kf&b twice in the next 2 sts. (8 sts increased.) Turn, purl 8 sts just increased. Turn, k 8 sts. Turn, p2tog four times. Turn, k2tog twice. Continue row as instructed. 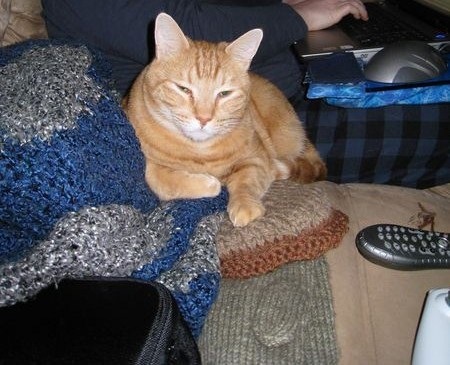 For large mouse, work with yarn held doubled. For small mouse, work with one strand. Next round: K2, Make Bobble, k4, Make Bobble, knit to the end of the round. Knit 3-5 rounds even. 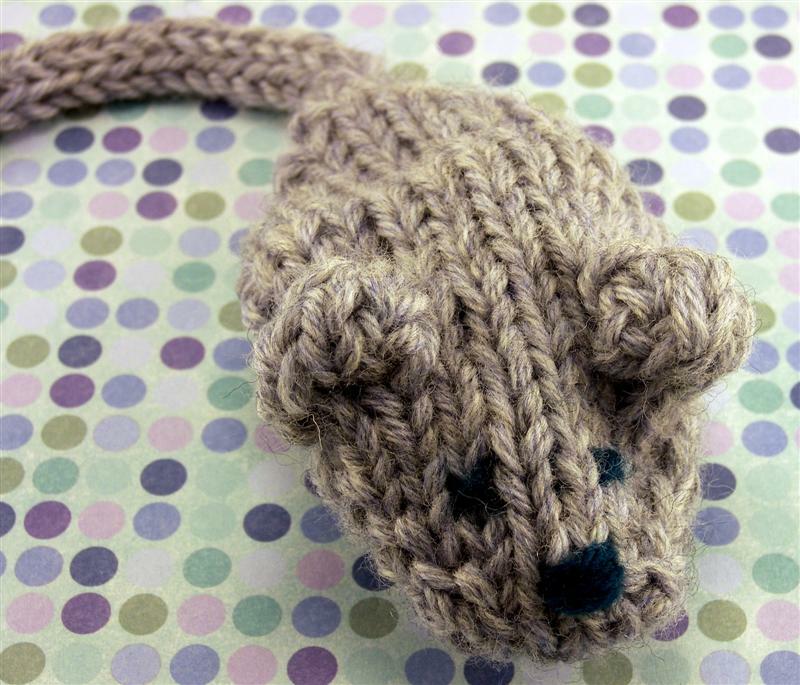 If you want a longer mouse body, knit more rounds. Small Mouse only: K2tog, k2. 3 sts remain. Small Mouse: Work 3-st I-cord until tail is at least 2” long. Embroider eyes, nose, etc in scrap yarn on the face below the ears. The small mouse can be felted by hand in about 10 minutes. Run some hot water (about as hot as you can comfortably stand) in the sink and dip your mouse in. Add some soap to the mouse and start to rub and squish him vigorously between your hands. (This might be a fun thing to make- um, ask your kids do for you.) When your mouse has lost his stitch definition and is the right size (keep felting him to make him smaller,) rinse him in cold water and set him aside to dry. The larger mouse can be felted by hand (takes a bit longer than the small mouse) or in the washer. If you’ve got any other felting projects, you can throw the mouse in with them. 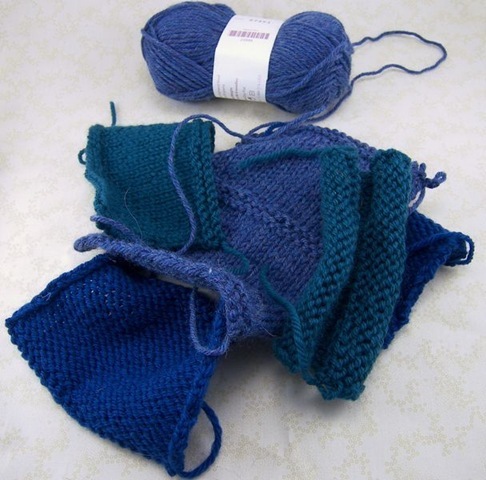 For more information on machine felting, check out this article on Knitty. 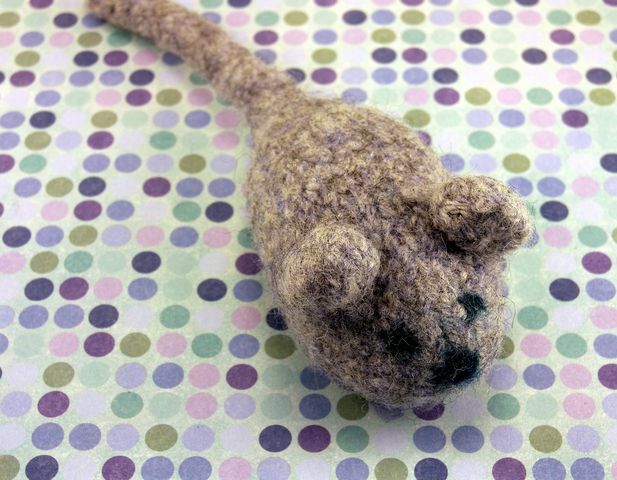 When the mouse is felted and dry, cut a small hole in the underside, stuff with toy stuffing and catnip, sew the opening back up, and give to the cat. Please Note: I post my patterns as soon as I’ve completed them because I’m excited to share them with you. They have not been fully tested. They are free, though. I’ve made every effort to make sure that the instructions are clear and error-free. There may be typos or other mistakes and if you find them or have any questions, please let me know by posting a comment or emailing me, dailyskein at gmail.com.